After a few weeks of boat preparation and a long day of sailing across the Gulf Stream we crashed hard last night. Mangrove Cay is just a tiny spec of an island but luckily the winds stayed calm overnight and we slept like babies. We couldn’t check into customs at the West End because they were hit hard by Hurricane Matthew and haven’t reopened yet. Which leaves us with a few options in the Abaco’s. 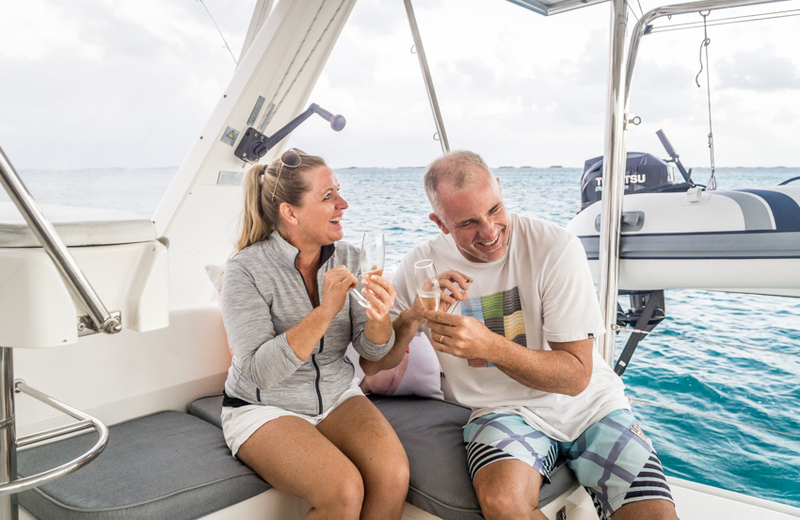 We joined our friends David and Kristy of s/v Latitude Adjustment and we’ve decided to head for the northern bit of the Abaco’s and check-in at Little Grand Cay. 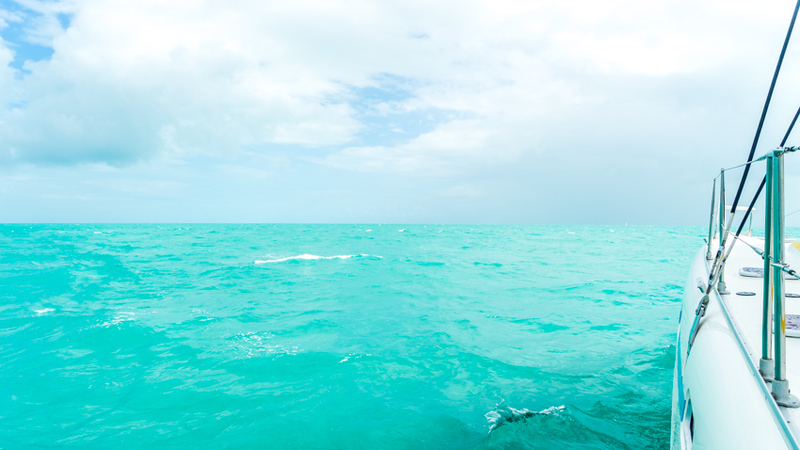 It’s only 25 nautical miles from Mangrove Cay and its crystal clear shallow water all the way. Sounds perfect, right? Crazy part is the winds are kicking up to 25+ knots out of the northeast, which is the direction we are heading. Today’s sail is going to be an upwind beat with a lot of tacking. We considered staying put to wait for calm winds, but we need to get checked in so we can touch land and start exploring. Plus, the wind speeds will continue to increase over the next few days, so this is our “best” weather window. What a day! 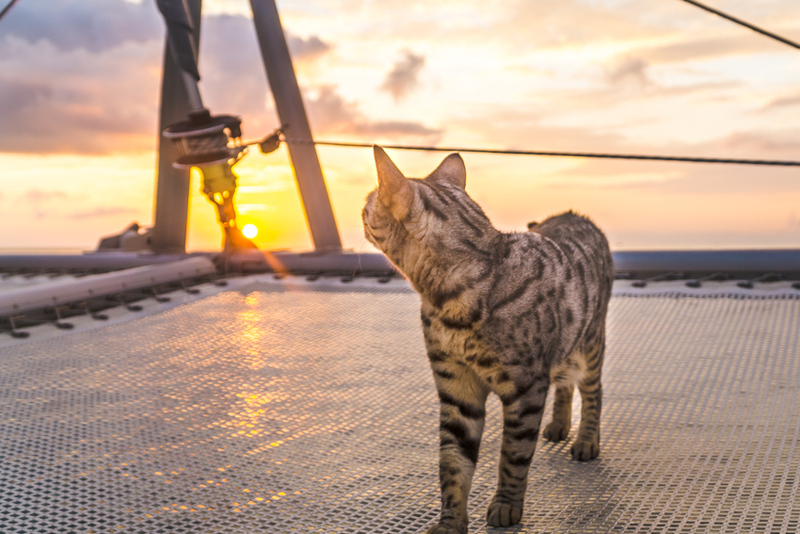 It all started off with a magnificent sunrise that even the cats were impressed by. Then top that off with the highest continuous winds we’ve sailed in so far and it was exhilarating. We’ve seen some winds kick up to 32knots in the past, but they came with a storm so the high wind was always short lived. Each little experience is growing our confidence, both in our boat and ourselves. That is probably our biggest takeaway so far from sailing and travel in general. We are continuously learning a lot about ourselves and how we handle situations. Sometimes we’re beaming with pride and others we’re hanging our heads in disbelief and shame. Sailing can be humbling to say the least. Some of the best sailing tales we’ve been told over the years have been about sailing in gale force winds (32-63 knots) and big storms. We’re not quite ready for that yet…but choosing to sail on these manageable 20-30 knot days are excellent reefing and high winds sailing practice. We’re learning more about how our boat handles, how much sail she likes up and where our personal strengths and weaknesses lie. Blowing a line sounds a lot like a gun shot. It’s scary. Then of course there was the chaos that came immediately after with our sail violently whipping about uncontrolled. It required quick, decisive action to realize what happened and then react to the situation. Luckily, we sprung into action. We didn’t panic and we communicated well. That was good. As Jason’s sheeting the genoa in you can hear in the background (of the video) “wait, wait, wait”; that’s me alerting him that a line is stuck, then you can hear “ok, go, go, go” right before our brand-new Action Cam is taken for an unexpected ride! Once we had the new line run and everything back in order we had to ask ourselves, “what did we learn?”. Here comes that 10-year rule again and in the form of an excellent lesson. Anyone can blow a line but it’s much more likely to happen on older, sun and salt ridden lines. We’ve mentioned before that we’ve been told there is a 5 and 10-year life span when it comes to boats and boating equipment. Some items last about 5 years while others last 10 or more. During our survey, it was pointed out that our running rigging (all the ropes, which once in use are not called ropes any longer, now they are called “lines”) were getting closer to the end of their life span and would need to be replaced within a year or two. However, it’s very hard to put an exact time stamp on a lot of these things, it’s more of an educated guess. Our lines are getting older but many of them do still have life in them. And every sailor we talk to says something like this: you must get as much life out of things as you reasonably can, without putting safety at risk. It’s not entirely about being frugal, it’s also about not being wasteful. So, we replaced a couple of lines that showed the most wear and tear, we bought a couple of backups for the trip and we plan to replace the others sometime in 2017. After this experience, I think we’ll stick to that plan or bump it up! We are learning how important it is not to have any questionable equipment, and if we do, we better have the replacement on board and accessible. Flags are a big, big part of boating, especially traveling abroad. There are a lot of rules about flags, how and when they should be used and in what order they should be flown. They are a symbol of courtesy, but also a form of communication. Just like the international diver down flag is used to let nearby boaters know there are people in the water. The yellow Q flag (quarantine) is flown under the starboard spreader of the mast until we have properly cleared customs and immigration. Once we are cleared, we pull down the Q flag and hoist the Bahamian flag as a sign of courtesy. We can then fly our American flag under the Bahamian flag to let people know where we are from. Now, you will notice that sometimes we won’t be flying any flags. Those little flags are not high quality and get ripped up quickly in high winds. So, we bring ours up and down a lot to preserve it. It’s common practice among the cruisers we’ve crossed paths with and while it is a courtesy to fly the courtesy flags, it is not legally required here. We’ve cleared customs to many countries in the past by foot, car, RV and plane, but never by boat. It’s a totally different experience! Each country has different rules and restrictions about what is required and allowed. Checking into the Bahamas was by far the easiest and friendliest customs experience we’ve ever had. We checked the customs website, made sure we had the proper documentation required and that proved to be all that was needed. It cost $300 cash (USD) for our 180-day cruising permit to be in the country and it includes a fishing license for the duration of our stay. A little Chambong celebration of our arrival with friends David and Kristy of SV Latitude Adjustment. You may notice in the video we say “keys” but in the post, and on the map, it shows “cay”. Although spelled differently in the USA, the Bahamians still call them keys. While we were researching our route, we kept saying it wrong, and I’m sure we’ll flub it many times still. Check out our interactive Map page where you can zoom, click and see all the adventures. It feels good to officially be in the Bahamas and we’re itching to start exploring. If you have any tips or favorite spots please share in the comments below. We’ll be bouncing around the Abaco’s through the holidays. Oh, and if you are here, let us know where and maybe we can say hello in person! Please, keep me updated and continue your good work. Hi! I know this isn’t a recent video but I was curious to what paperwork you had to get for your cats. Any ideas what we need to do for my cat to go to the Bahamas? Do you need to do a lot of paperwork if she is staying in board? Thank you for any information you can provide. I recall them mentioning that since the cats stay onboard it serves as “quarantine” because they’re not coming into contact with other animals. Otherwise, when you’re checking in an getting your cruising permit you just need to present a copy of their rabies certificates and a Health Certificate from a vet that the animal is healthy. Check the Bahamas website, there are forms you’re supposed to mail in advance but our custom’s guy didn’t seem to care. Fun with Flags….couldn’t resist after reading the comment section…. I forgot to mention earlier but we enjoyed the best dinner at the Abaco Inn. Very exciting. Love to watch your adventures. Love you like my kids and I would say to them, please consider that PFD that Greg mentioned when on deck . Be safe, and always waiting to see what’s next! Love following your sailing adventure. My husband and I sold everything in April, bought a 38′ Leopard cat and have been living aboard in St. Martin through hurricane season (we’re 55 and this is our first sailboat!) One more week here and then we’re headed to the BVI. I feel your “butterflies” as this will also be our first overnight, first “out of sight of land” and definitely the longest sail we’ve done. Look forward to your Bahamas adventure as that is where we think we may end up in a year or two! And it’s nice to know we’re not the only newbies out here learning as we go 🙂 Happy sailing! Love your adventure! Keep them coming. Filming is excellent and not the least bit boring. You both rock! Sail on! If you both continue not wearing some type of life vest especially during very windy days, when one of you gets tossed in its not going to be pretty. You folks are new to sailing so wise up and wear something. Great insight into your wild ride! Good to know about how to enter other countries…I was wondering about that. David and Kristy are a big help for all those little things you wouldn’t even know to ask. Fun moments…good memories! You might want to save that worn rope to wind around a sea worthy Christmas tree along with a few lures and bobbers! What kind of breakfast sandwich was that? I had no idea Nikki could chop like a professional…lightning ninja knife skills! Fun…thanks for the video! Sint Maarten, the Lagone has the cheapest and the bigest ship repairs. Jamaica, Port Antonio is also known for good quality and cheap prices. If you will happen to be in BVI mid June 2017, we will find you there. Jacob and I watched this video together. Should we bring champagne? We can’t wait to see you !! ? Ok…i’m a bit of a safety Joe, in that I’ve owned several power boats, and I’m a member of the Coast Guard Aux. My personal practice with PFD’s is that I wore them when conditions warranted, like when it was rough or when boating alone. So when you’re up on the bow in heavy seas, why not wear one? Isn’t it difficult to maneuver a sailboat under sail to a man overboard? Seems that a PFD buys you time and also serves as a point of reference. Orange on a sea of green/blue. Injoyed your last video. Sorry about your line breaking. I look foreward to your next video. Finally got my wife to watch. She really injoyed it. This is just my second time wring in to you. But i’v been enjoying your travels for some time. Tring to get our son and his new wife to tune into your video’s. Maybe they can see a different side of working hard. They both haul fuel for a tank line trucking co. Putting in there 14 hour days. Of course we worry about them because it’s such a dangerous occupation. But right now they’re unconvinced that there’s anything else out there that they can make the living they do Driving tank trucks. I hope in the near future they can watch your videos and be as impressed as me and my wife are. Please stay safe. A pleasure – you are entertaining, humorous and you teach. More than a full time job. And you have to edit your video too – darn good – be safe and I look forward to your next show!! Cheers to all the Firsts. You are enjoying your adventures and that’s what matters. That was a bit freaky losing that line but you both did awesome. Til next time ahoy matey. Wynns — conventional wisdom about sailing cats upwind says 1 reef at 15 knots, 2 at 20, 3 at 25… perhaps be a little more aggressive in reefing early, to avoid learning how to sail a cat upside down (post capsize)? or check with a few more seasoned cat sailors and see what they say?? It seems to me you were a little over-pressed (too much canvas) Be safe out there! We follow our boats reeling guide exactly and do tend to be conservative about it. We did put our first reef in at the 15-20 mark, as our guide suggests. Hi, Jason and Nikki, I love watching all of your videos!!! Great job sailing 100 nautical miles!!!! I wish you guys safe trips and good wind! Hope the cats are well and you too. Enjoy the Bahamas and the clear blue waters!!! I noticed a green, perhaps plastic knife for cutting. I’m assuming you had it on the RV. Can you share where I can purchase? You guys are such loving troopers and I just adore your films. Thanks as always! Watching the video slowly, shows that the knife has “Cuisinart” written on the side of it. Looking at Cuisinart’s website, the knife appears to be a ceramic coated, stainless steel knife, possibly the “7 inch Santoku knife” item. Thanks. It was really hard for me to tell it was ceramic. I am so happy you reached the Bahamas! 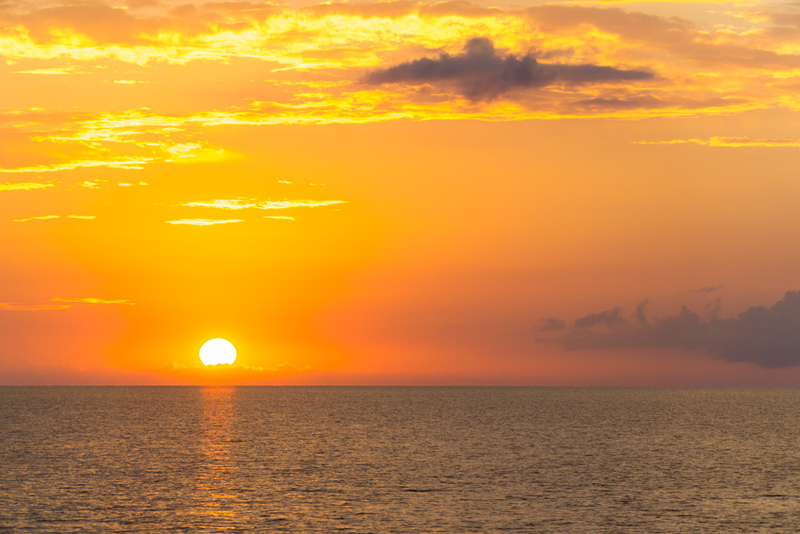 The Bahamas is our favourite destination in the Carribean. I highly recommend that you explore Long Island Bahamas. The people are extremely friendly, you can easily find fresh organic provisions at the weekly Saturday Farmer’s market, and wonderful home made ice cream. while you are on the island you can swim at Dean”s Blue Hole , the deepest blue hole in the world, and dance the night away at Tiny’s Hurricane Hole to traditional Bahamian raje and scrape music by Smacky and the Boys. Wishing you de best time. Love this video! It brings back so many memories of sailing in the San Francisco Bay for 13 years. A normal sail for us was 15 to 20 knots. I was disappointed if there was less wind. It makes sailing so much more fun with good winds. You also remind me of all the things that go wrong. It was always something for the first 10 years! I’m getting ready to go solo in my motorhome in January. Reflecting on my sailing years…. RVing seems much easier! Also my SJCAM just arrived yesterday. Got your discount and accessories. I want to video my adventures and use your videos as a guide on how to do it beautifully. I watch a lot of videos and yours are be far the very best. You guys make it hard to watch other videos. You set the bar very high! Nikki, I see you’re wearing gloves. Good! Fair winds and following seas! Brilliant job! Now That is sailing. Fun to see the adventure unfolding and to see you smiling throughout. Yikes. We have a saying on our boat: Reef early, reef often. I hate that feeling that I should be running to the high side of the boat. Hi Wynns, it’s been so much fun reading about your sailing adventures.. We’ve booked a 2 week charter in the BVI in April (likely too far to meet up, but who knows where you’ll be in 5 months!) and I’m working on provisioning… Any favorite meals or snacks while underway? We’ve seen you making some great looking food so far, but I’d love more info. This is my first charter experience- our sailboat lives in a nearby reservoir and the only provisioning I have to do is bring dinner from home. Thanks in advance! Hey Bri, i’ve been a BVI charter guy for a few years. Don’t overdo the provisioning before hand. Maybe day or two of food, at most, before you actually get on the boat and see what is there. I assume you are sailing out of Tortola or Nanny Cay, so, West End (Sopers Hole) and also the Rite Way in Fat Hogs Bay (on the east end of the island) are where you want to go, with the boat, to stock up. Bring an i-pad with either Navionics, or, Garmin’s Bluechart app… and maybe watch a few videos about how to pick up mooring balls…. and all will be lovely. So many great spots to go for dinner too, so, we seldom provision our evening meals. Well done on your first ’emergency’. Aren’t you glad it happened in daylight? David gave you the (right side up) flag lesson so I’ll just add a comment. Have you thought of having a personal “Gone with the Wynns” flag or burgee made? It would be a great signature for your Yacht. See you in 4 weeks maybe. Awesome episode. I much prefer sailing channels when I see the boat and crew going to destinations rather than boat work, so I’m super-enjoying your episodes now that you are on the move. Just an opinion (FWIW) on your travel plans and how it will impact the videos. My view is that you should just keep going forwards with your travelling and not return to Florida in Spring 2017. I think that the “we’re returning to Florida” vibe that your videos will have if you do return to Florida will feel negative and also you’ll then have more “boat work in Florida” videos, followed by another ‘wait to cross the Gulf Stream again’ period of time. I think that this will give your videos the feeling that you aren’t going anywhere fast and just feel a bit negative. I’m sure that you can get boat work done in places further south, eg. Virgin Gorda, St. Martin or Grenada and I think that this will feel more like you are constantly going forwards and pushing your boundaries and provide greater excitement for the viewer. With respect to your yellow Q flag in the latest episode. I note that you flew it upside down. It doesn’t matter, because it’s symmetrical, but some flags won’t be symmetrical and you may wonder which way up to fly them. Most flags have either a toggle or a loop on one corner and a ‘tail’ on the other corner (A short piece of string hanging from the flag). The flag goes tail side down (always, unless it’s been made wrongly). 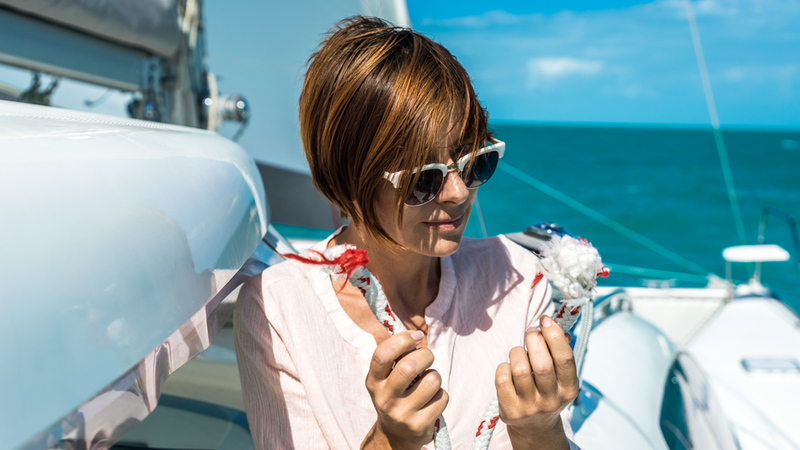 So to attach the top of the flag to your halyard, if you have a toggle, form a loop in your halyard using a bowline or an overhand loop knot or equivalent and fit the toggle through it. If you just have a loop on your flag, since the loop forms a “bight”, use a knot like a sheetbend or double sheetbend to attach the halyard to the flag. The ‘tail’ (I’m not sure what the proper name is) can be attached to the halyard using a square knot (aka reef knot) or equivalent. 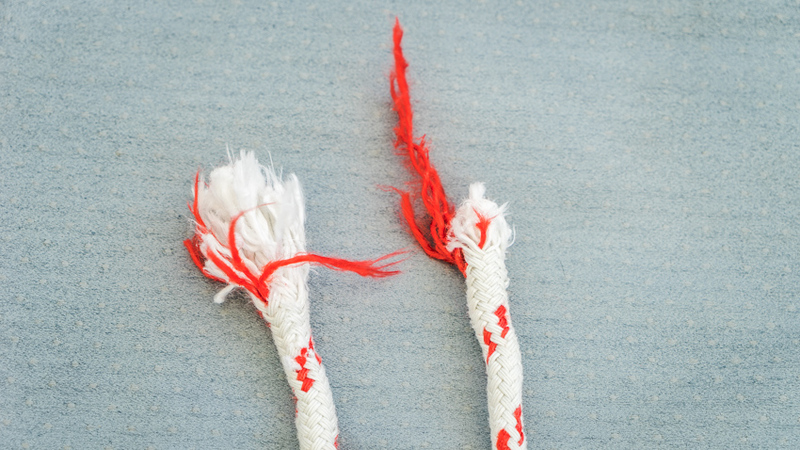 I don’t think that the knot’s matter too much so long as they are strong. Keep having fun and keep making the videos… loving them more and more. In my flag piece I’ve assumed that you will have two free ends on your halyard. If you have these ends tied together to form a continuous loop, possibly to stop one of the ends disappearing up the mast and falling out of the block in which it hangs from, you’ll have to do things slightly differently. You can form a small loop in your halyard without needing the ends, by tying the overhand loop knot (the bowline won’t work in this case). You can put the toggle through that loop and then attach the “tail” of the flag to the halyard using a rolling hitch. If you have purchased a flag with a loop at the top, then I suggest that you tie a loop in your halyard with the overhand loop knot, then tie the loop in the halyard and the loop in the flag together, with a separate piece of string. Then tie the tail of the flag to the halyard with the rolling hitch. I think that this scenario is what the crew of SV Latitude Adjustment showed in your video, but since they showed you how to fly the flag upside down, I’m including this comment for completeness, in case it’s different. Yay to all your firsts! It’s exciting to see you guys make it to the Bahamas for some new adventures. I was thinking that the American flag would be flown from the stern perhaps rather than under another countries flag on the spreader? Just wondering. I am an American but I would love to know the answer to your question myself. Larry I agree. The courtesy flag is flown from the starboard halyard, but the US flag should go on the stern. It never is flown below another flag (if you’re an American). Correction — one exception. The US Navy will fly a church pennant above the US Flag while they are holding church services onboard the ship. I believe the (American) flag blown below the Bahamian flag on this halyard represents the CITIZENSHIP of crew and it not their National Ensign (which would be flown at the stern). Watching all of these videos, i have also noticed the country flag(s) of crew also from from the opposing (left) halyard. Larry is correct. Although it isn’t just the US flag – it applies to national flags on all ships and yachts. When you are in the waters of another country you should be flying the US flag from the stern of your yacht. You should never be flying it from a halyard beneath the courtesy flag of the country that you are visiting. This doesn’t just apply to the USA but to all countries. 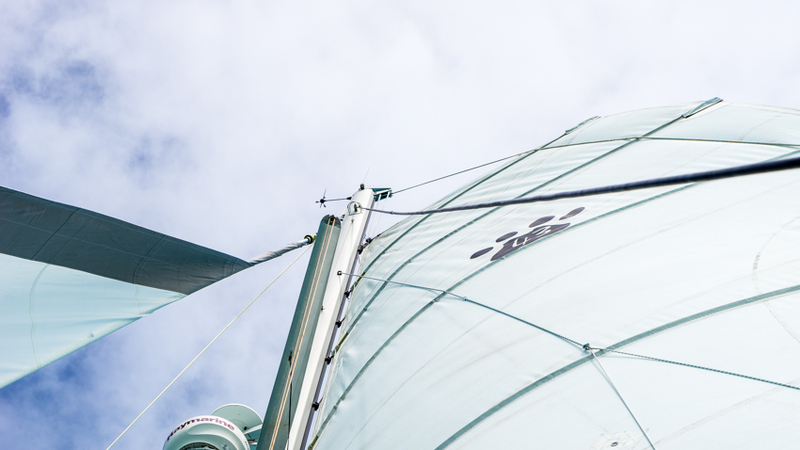 So, for example, if a yacht that was registered in the Bahamas visited US waters then they would need to fly the Bahamas flag from their stern and the US flag from a halyard on the starboard spreaders (although I think that most cats don’t have spreaders?). You might not think that this sort of stuff is important, but some countries (especially in South America and Europe) can get really funny about it and cause you a lot of hassle so, please, either get a flag staff or attach your US flag to your backstay – it really shouldn’t go on a halyard beneath a courtesy flag.